Hallo. Ich habe die ProMods 2.32 auf Version 1.33 des ETS2. Ich bin auf dieser Version bis jetzt drei Aufträge gefahren. Einer Dresden (D) - Arnheim (NL), der nächste Arnheim (NL) - Wiesbaden (D), der dritte Wiesbaden (D) - Görlitz (D/(CZ auf der Karte)). Mir sind hierbei fehlende Texturen aufgefallen. Es scheint so, als wäre der "Körper" da, nicht aber die Textur, das Objekt ist pechschwarz. Und das ganze in teils extremen Ausmaßen, ganze Städte sind betroffen, z.B. Görlitz. Auch Straßen werden falsch dargestellt, wobei mir das bis jetzt nur in einer Autobahnbaustelle aufgefallen ist. Ich habe zu Testzwecken extra nur die ProMods und die Addons der ProMods (TCP/CAP) aktiviert, der Fehler ist noch da, es sollte also an der Karte liegen. Hello. I'm using ProMods 2.32 on ETS2 version 1.33. Till now, I've driven three contracts. At first, I drove from Dresden (Germany) to Arnheim (Netherlands), then from Arnheim (Netherlands) to Wiesbaden (Germany) and then from Wiesbaden (Germany) to Görlitz (Germany/(Czech Republic on the Map)). While doing that, I perceived missing textures. It seems like the "body" of the object is there, but there's no texture, the object is deep black. And this issue appears in extremely big sizes, whole cities are covered with black objects, e.g. Görlitz. Also, streets are shown wrong, but I only saw this in an construction zone on an Autobahn for one time. For test purposes, I only activated ProMods an the ProMods addons (TCP/CAP), but the issue is still there, so I think the mistake is somewhere in the map mod files. Aus irgendeinem Grund sind meine Screenshots des Problems zu groß, um sie hier mit hochzuladen (2,17 bzw. 1,7 MB). For some reason, my screenshots of the problem are to big to upload them here (2,17 and 1,7 MB). Thank you very much, DirectX worked for me! Last edited by bmwGTR on 23 Dec 2018 18:56, edited 1 time in total. 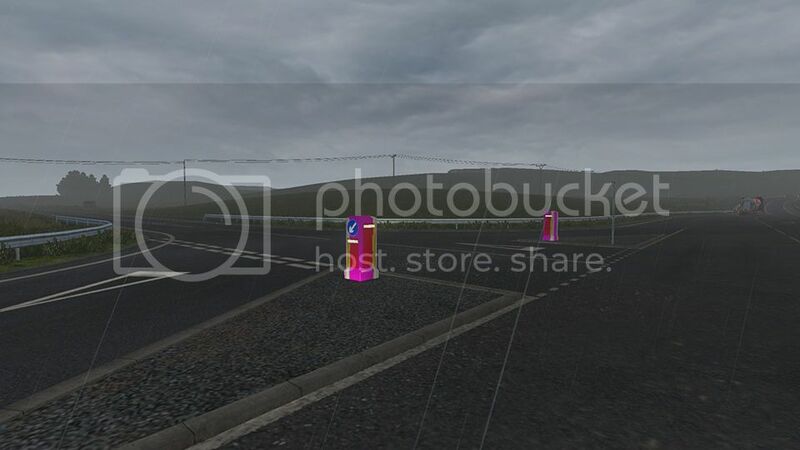 Is anyone else experiencing this misaligned/purple texture issue in the UK area of ProMods 2.32? It's caused by latest game patch and it's fixed for the next version already. For awhile now some of the buildings and bridges in the game are pink, does anyone know hot to fix this? This problem is caused by the recent game update. It will be fixed in the next version.